Follow @mcphoo Tweet In the world of alluring supplements, coq10 feels like a relative new comer. Is it worth considering adding to one's regimen? CoQ10 is being investigated in so many contexts, the following is a consideration of where it's been looked at in athletics to help make a determination as to whether or not it's worth considering for your own regimen. Shaking the magic 8 ball, signs point to Yes, especially as we age. CoQ10 as a supplement has been around for awhile, has been heavily studied it seems in Japan in particular, where it became a legal food supplement in 2001. The first review on any toxicity seems to have been done only in 2008 (it's "highly safe"). In the west, it's mainly been used in the area of heart conditions, muscular dystrophy and some uses to combat effects of statins (cholesterol drugs). More generally it is being promoted as a free-radical buster (anti-ageing) and as something good for the skin. In Athletics, however, it's mainly been considered as to whether or not it does anything for aerobic power. Co-enzyme Q10 is produced in the body - everywhere in the body. Hence it's other name: ubiquinone - ubi, latin, everywhere. It's in that amazing cell, the mitochondria. We develop increasing amounts of mitochondria when we do aerobic work over time. Aerobic work means pretty much everything where we aren't sucking wind as aerobic=predominantly oxygen based. Mitochondria is the fat burning engine of the bod y. We develop more of it from aerobic work to help better oxygenate our bodies' processes including energy production. Indeed, CoQ10 is involved in the electron transport chain - a key part of converting fuel into ATP, so it's essential to that conversion process. The thing about exercise is that the harder the effort, the more free radicals and reactvie oxygen species are produced. There are questions in research right now about how these things contribute to muscle damage experienced as everything from fatigue to DOMS. Since 96, it's been hypothesized that ROS and muscle stress impact coq10 levels in muscle tissue, and somehow this has a negative effect on muscle performance. The complement to this observation of course is that well, let's bring the level of coq10 up with supplementation. We see similar logic and results operating with creatine to be available for ATP conversion in the high effort early anaerobic short duration phosphagen energy system (discussed in this b2d article on creatine and beta-alanine for aerobic power). The plus side also of keeping an aerobic system able to work more may also mean that aerobic threshold extends, putting off going anaerobic for fuel - to the speedily available but sparse glycolytic (think carbohydrate) energy system. Study results have been all over the map in terms of whether More is Better for athletes. The intriguing thing about such studies and results is how the protocols - the way the study was performed - differs. So we can't just say CoQ10 didn't effect aerobic power - we have to ask, under what conditions is the jury still out - where if anywhere is their promise? 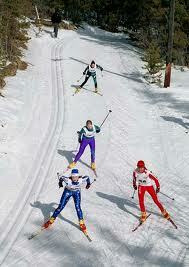 Consider a way early study in 1997 of whom some might say are the ultimate aerobic athletes, cross country skiiers. 94% of these elite Finnish team athletes "felt" their performance and recovery was better compared with only 33% on placebo. Beyond the affect, there were also results that showed a not huge but still significant effect on both anaerobic and aerobic groups compared with placebo over 6 weeks of training. In 2003, there was a 'systemic review' of CoQ10 in physical exercies (hypertension and heart failure, too). The finding was that "six showed a modest improvement in exercise capacity with CoQ10 supplementation [including the one above] but five showed no effect." We identified eleven studies in which CoQ10 was tested for an effect on exercise capacity, six were positive and five showed no effect. Of the six positive trials (Table 1), four were in trained sports persons, athletes, cyclists and skiers, and two involved untrained individuals. Subjects (n = 18 to 28 per study) were given CoQ10, 90 to 100 mg per day for 4 to 8 weeks. Benefits were observed in terms of improved maximum oxygen consumption, averaging 8% (range 3% to 18%) and improved exercise capacity, averaging 13% (range 5% to 33%). Five trials failed to show any statistically significant benefit of CoQ10 (Table 2). Four of these were in trained sports persons and one in untrained individuals. Trials included 10 to 19 subjects and the duration of treatment was four to eight weeks. Dosage and duration of therapy were similar in the two groups of studies. It is worth noting that whereas all the negative studies were published in peer-reviewed journals, only one of the six positive studies [our skier paper -mc] were published in this way, the other five being published as conference proceedings, probably not peer-reviewed and therefore carried less weight. In conclusion it appears that a modest improvement in exercise capacity may be observed with CoQ10 supplementation but this is not a consistent finding. Inconsistencies in trial results may be due to small numbers of subjects enrolled [in both the showing signs of effect and no signs - mc] and to differences in experimental design. In view of the indication of benefit in some studies, further larger randomised trials in this area are indicated. In 2005, in what seems an even crappier study for population, took 6 people and over four weeks looked at whether their was an effect. There wasn't. I can't get at the actual study to see how it was run or whether these men with similar vo2max levels for their age (not great). But here's something recent that seems really interesting. A new (2010) study spent 8 weeks with groups of sedentary guys. It's a randomized, double blind kinda set up. Fifteen guys. Here's what was found using wingate tests (those things elsewhere shown to be pretty good for developing mitochondria in 6 mins of effort). The measures are Peak Power, Mean Power and Fatigue index. The cool thing that the researchers found is that the benefit of the coq10 didn't show up in the coq10 group until the fifth wingate (WT) test. Let's put this in perspective. Wingates are pretty much your all out sprint for 30 secs. Doing one is hard. Doing 3, is absolutely no fun (what the blokes in the 6min a week trial did). Doing 5? With 2 mins of recovery between each? That's not really what you'd call full recovery. It's a break. And it's hard. Why they decided to do 5 of these gruelling sprints? The rationale tells us about the hypothesis of what we might see with coq10. The WTs 30-second duration was chosen for being sufficiently long, not only for eliciting maximal glycolytic power but also for requiring a good measure of ‘‘glycolytic/anaerobic endurance’’ (10). The WT strongly stimulates both the adenosine triphosphate-phosphocreatine and glycolytic systems (26), and thus activates purine catabolism and lactic acid production (12). In addition, supramaximal anaerobic exercise has been associated with major increase in plasma catecholamine levels [catecholamines, by the way, are important for fat mobilization, and while any action spurs them, the greater the load the greater the release it seems -mc] (36). These factors are the cause of oxidative stress in supramaximal anaerobic exercise. It has been shown that during WT, performance to be dependent on energy release from both anaerobic and aerobic processes (3,11). It has been suggested that the WT may be used as an exercise task that stimulates both aerobic and anaerobic processes (21). In the previous studies, it has been demonstrated that aerobic contribution in WT is between 19.5 (3) and 27% (28) but during the repeated supramaximal activities aerobic contribution might be increased. Therefore, in this study, we are planning to investigate the effects of CoQ10, which has been known to effects on aerobic performance. The purpose of this study was to determine the effects of oral CoQ10 supplementation on performance during repeated bouts of supramaximal exercise. if the extra coq10 in the mitochondria is going to show up, it will show up by being fatiuge busting in these more aerobic, later repeats, by being able to make more energy availabe when the system goes more oxidative. with the baseline exercise session (p less than 0.05). More intriguingly, when considering that fifth trial peak power, they harken back to previous work. Let me give you the whole thing, because the use of related research to make the case is fascinating, and has implications for one's decision to take coq10 or not. For this, bear in mind the energy system hierarchy, simplified, of phophagen - burns out in about 30 secs; takes about 5 mins to recover. 2 mins recovery before going into another anaerobic interval is not going to recharge that, which means cutting into the glycolytic - sugar stores. Those have about a 3-10min shelf life and at supramaximal, we're talking the shorter end of the scale. Then there's the aerobic, fat burning system. Bonetti et al. (6) suggested that increase in muscle performance might be due to the antioxidant effect of CoQ10 supplementation and/or its probable action on the central nervous system. There is a direct relationship between the PP and MP: PP is based on the alactic (phosphagen) anaerobic processes and reflects to maximal anaerobic power and MP shows the anaerobic glycolysis rate in muscles (25,32). [...] In conclusion, the most important effect of CoQ10 supplementation is an increase in MP during the WT5. Increase of the MP during WT5 suggested that contribution of aerobic metabolism was increased during the repeated supramaximal exercises and CoQ10 supplementation increased performance in this type of exercises. 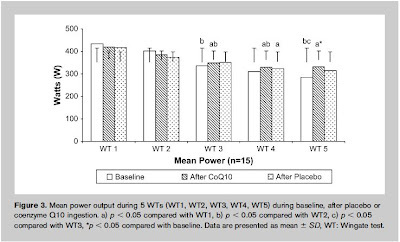 Therefore, we concluded that CoQ10 supplementation increases exercise performance, especially anaerobic capacity during repeated bouts of supramaximal exercises. This is the first study investigating the effects of CoQ10 on supramaximal exercises. While these are cool results - especially because they map to the hypothesis of what should be shown in the trial if the model is in the zone of being correct, is that difference in power a really big deal? Maybe indirectly in terms of what it *might* be doing anti-oxidatively. This study suggests that the effects of 8 weeks of CoQ10 supplementation on PP and FI during the 5WTs were limited. Of primary importance, our results demonstrate that CoQ10 supplementation increased MP during the repeated bouts of supramaximal exercise. This increase in MP might be due to antioxidant effect of CoQ10 or contribution of CoQ10 to the aerobic metabolism and increasing of the aerobic contribution caused to amelioration of performance during the repeated bouts of the supramaximal exercises. It means that CoQ10 might be used as an ergogenic aid to increase anaerobic power after its effect clearly exhibited with the further research. An ergogenic aid is just something that helps performance. But note the typical reserved speculativeness of the research claims. (1) The effect is limited and (2) we still don't know exactly what's causing the effect we see in the results. What Do these Results Portend? The interesting thing, i find, about the results, is that, despite the limited effects, there may be especial benefit for athletes as we age. Coq10 levels go down with age - hence the other research that looks at heart disease and skin and anti-oxidation etc. If we see that the effect on aerobic power is from anti-oxidant processes, perhaps that's a good sign in general for enhancing recovery - one of the things that gets more challenging, again, as we age. Another possibility here is that the coq10 is helping the body make use of fat oxidation longer rather than having to punt to the less abundant resources of the anaerobic system. This result also has benefits for effort and recovery. One of the things to note is that unlike the previous study on sedentary men, this more recent study took 8 weeks to run, not four, and used a somewhat different (better reasoned) protocol for its supramaximal load reps - timing the effect to be seen when going long enough and hard enough to trigger a more aerobic response, the aerobic being where the mitochondria oxygen burners kick in. Again, the directly observed effect mayn't be great. But it's still statistically significant, and it may be, as one of the grocery chains in the UK claims that "every little helps"
Last week, b2d presented a review of where creatine and beta-alanine may fit into benefitting aerobic effort by improving ventilatory threshold in particular at sub-maximal efforts and total work done, as well as time to exhaustion. Coq10 is showing up as benefitting effort in supramaximal efforts - those intense wingates. The obvious question would be what might the combined effect be for aerobic power across sub to supra efforts? The usual doses on the shelf of coq10 are either 30 or 100mg. Natural coq10 being usually advised over synthetic for absorption etc. Most of the athletic research averages out around 100mg - none are anywhere as low as 30. In a way that's kind of too bad. I haven't seen in any of these pieces a rationale for the particular amounts of CoQ10 chosen, or for that matter why regular dietary sups are only 30. More is not always better, but all i can point to is that the *limited* effects/benefits shown in the CoQ10 work are all at the 100's-ish levels. The effect from 30 mg is mild, mostly consisting of a slightly higher energy level. The effects become more noticeable with 50 mg. I have taken up to 100 mg in the morning. On this dose, I notice an increase in energy as the day goes on, with an urge to take a long walk or be physically active. There is enhanced focus, motivation, and productivity, along with the desire to talk to people. The 100-mg dose of CoQ10, though, is too much since I feel too energetic and alert even in late evening when I want to slow down and get ready for sleep. I usually do not recommend more than 10 to 50 mg of CoQ10 on a long term basis without medical supervision. Wow again. Personally i've been doing 30mg and haven't noticed a thing - not even mild. Perhaps i work out more than Dr. Shalen and so 30mg is still being attenuated by these training bouts? I may bump it up to 100 for a month or so and see if there's any perceivable effect. This supplement may be of interest for different reasons to different groups: for those wanting to eek out that wee bit more effort in their training, this may be a complement to that work. For those going off warranty (as a colleague calls hitting over forty) its value may be more in the potential recovery benefit than in direct work. I've been taking 100mg for sometime, I don't notice increase energy during the day but do notice less DOMS. But I also take L-arginine which may assist with that as well due to increased vaso-dialation. Great work as usual MC. Bevin thanks for dropping by. I take both for the heart health aspects. Not to support my my kb workouts per se. Dr. Ignarro won the Nobel in Medicine in 1998 for showing the anti-inflamatory effects of statins and l-arg are the same. Personally I believe this is more of a factor in the thx effect of statins than the cholesterol lowering. But my perception is less DOMS as well.